Trackless garage doors are available in cedar. Cedar is definitely the most popular and common material used for wooden garage doors. Its rich and ‘multi-tonal’ quality makes it excellent for this. It is also extremely lightweight, highly resistant to rot and doesn’t tend to expand or contract. A disadvantage of cedar, however, is that it is a very soft wood. This can often result in damage from the user, it is easily marked or scratched especially when used manually. Oak is a very popular timber choice today. It was inevitable that it would become fashionable for other exterior doors. Oak is a heavy, hard and expensive wood so not favoured by garage door manufacturers. However, oak doors are available in bespoke up and over style doors and in the trackless Silvelox Overlap range. The Silvelox range offer the option of Cedar and Oak throughout the collection as well other timbers. 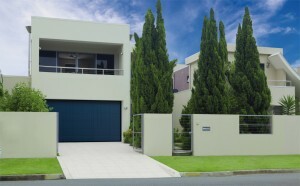 Silvelox specialise in being the world’s first trackless garage door. The Overlap trackless works without tracks or springs and instead uses a double counterweight system to give a smoother, automatic operation. How does a trackless sectional door work? The top section opens to sit horizontally, the bottom section then slides back below the top one to sit horizontally underneath it. Silvelox Overlap ARA is a sectional garage door made from 75mm thick eco-wood panels. Available in 6 different timber finishes, and in a range of stains and 15 standard paint colours as well as a much larger collection of non-standard colours. Silvelox Overlap doors are one of the most thermally efficient garage doors on the market. Approximately 1/3 better than traditional sectional garage doors. Handles can be added in a variety of styles and shapes to suit customer tastes and designs. All Silvelox garage doors are also available in matching front door designs. For more information regarding any of the products in our ranges please get in touch. Our friendly team can help. Or, view our full range of trackless garage doors online.